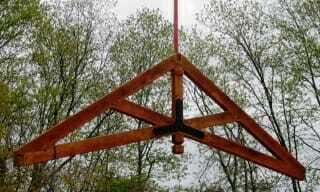 Let Us Custom Design Exposed Wood Trusses or Beams for your Home, Lobby, Entryway, Lodge, or Restaurant. 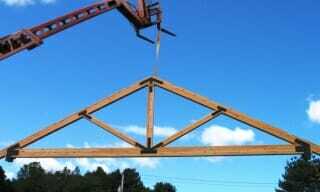 Vermont Timber Works designs heavy timber trusses for homes, businesses and commercial projects. 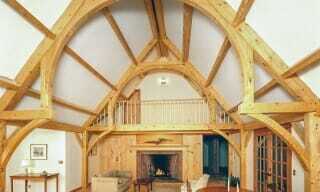 Timber trusses look great in hotels, entryways, and restaurants with cathedral and vaulted ceilings as well. Natural Wood Trusses enrich the rustic beauty of any space you can imagine. 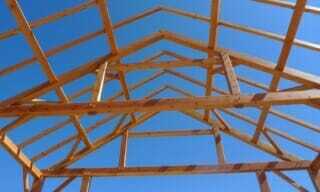 While all our trusses look decorative, most are structural and are designed to carry heavy roof loads. We use traditional mortise and tenon joinery held with hardwood pegs and decorative steel plate connections with heavy bolts. With over thirty years experience fabricating Timber Frames, we can create trusses to suit whatever design you have in mind. Timber Trusses are a beautiful and interesting design element to incorporate into new structures, and their design and aesthetic are crucial to the overall feeling and appearance of whatever space they inhabit. Designing your custom Wood Trusses is a creative process that considers not just the trusses, but the structure as a whole. From design to installation, we will communicate closely with you to ensure that the trusses we fabricate fit your building’s style and space perfectly. At Vermont Timber Works, we have years of experience handcrafting beautiful, high-quality heavy timber trusses. 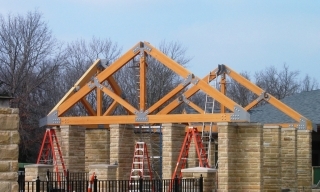 We want to understand your vision, your specifications, and your goals so that we can incorporate our trusses into your structure exactly how you envision it. After we have discussed the concept for your Trusses, we will begin the design process by drawing preliminary sketches for review and pricing. These are then turned into a 3D model and we will consult our engineers to ensure structural stability. We will share all this with you for your final approval. Then we will create detailed 2D shop drawings which we will use to create your trusses. Before we begin fabricating your Trusses, raw wood is ordered from our supplier and delivered to our workshop. All of our Trusses are cut by hand by our experienced craftsmen to your custom size and specification. The Trusses are sanded and a stain or urethane of your choice is applied. After fabricating the custom trusses for your structure in our workshop, we will ship them to the job site by tractor trailer truck. Then you can have a builder or an independent contractor install the trusses in your home, restaurant, or office, or we can install them for you. Timber Trusses do not need to be structurally necessary to elevate a space and enrich the appearance of the building. Trusses can be designed to be non-structural and to be purely decorative. This is one way to achieve the look of a Timber Frame building while using conventional framing. 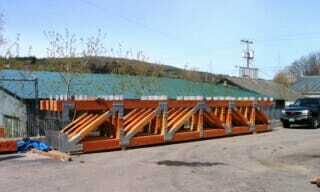 Depending on the design and structural requirements of the Timber Frame, Steel Plates and Tie Bars may be needed. Steel can also be incorporated into the design when it is desired purely for aesthetic appeal. We’re happy to design your Trusses with custom steel components. Traditional Mortise and Tenon Joinery is how Timber Frames have been connected since their inception. At Vermont Timber Works we rely on traditional joinery to make the connections in our Timber Frames. You can learn more about Traditional Joinery as well as other types of Timber Frame Joinery on our website. Our Trusses are a beautiful and striking addition to any space whether it be in a home, restaurant, hotel, or commercial location. We have 30 years of experience designing and fabricating custom Timber Trusses for a variety of spaces.